A short while ago, I was in touch with a TV company shooting an infotainment series on mysterious manors. They were interested in Johann Conrad Dippel (1673-1734) as their picks included Castle Frankenstein near Darmstadt, Germany, where he is rumoured to have conducted all sorts of disgusting experiments involving human corpses and mutilated animals. According to Radu Florescu, the author of In Search of Frankenstein (1975; 1996 ed., pp. 76-92; a review may be found here), it was this very castle and the alchemist Dippel who inspired Mary Shelley’s famous novel, Frankenstein (1818). In spite of the fact that Florescu’s grounds for such a claim resemble conjecture and conspiracy theory rather than what would usually qualify as evidence, the identification took hold and is spread far and wide throughout the internet and elsewhere in popular culture. And by the same token, Dippel has come to appear as the ‘real Frankenstein’ to the Anglophone world at large. But if we consider historical and scholarly sources, how impressive is Dippel’s Real Frankenstein Potential actually? Interestingly, in German scholarship—which has engaged with Dippel since roughly the 1780s, on and off—we encounter a somewhat different picture of the man: since Wilhelm Bender’s 1882 biography, he appears mainly as a radical Pietist, advocate of freedom of conscience and forerunner of the Enlightenment. 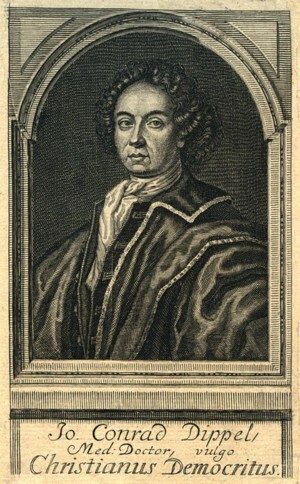 At worst, that is, to an unsympathetic biographer such as Johann Christoph Adelung, who included Dippel in his History of Human Folly (1785, vol. 1, 314-347), he appeared as a religious enthusiast governed by irrational sentiments and a deceived alchemist squandering money; at best, and just a few years earlier, Dippel was styled a second Martin Luther in J. C. G. Ackermann’s 1781 biography. There is thus precious little indication in German scholarship that Dippel had all that much Real Frankenstein Potential. At the same time, there is a strong theological bias that effectively overshadows Dippel’s chymical and medical work. Now, the most reliable biographies agree that Dippel was born on, or at least very close to, Castle Frankenstein on August 11, 1673. Because of that, Dippel eventually added designations of origin greatly enhancing his Real Frankenstein Potential (well, according to some people) when matriculating at the Latin school in Darmstadt (‘Francostenensis’) and at the University of Gießen (‘Strataemontanus-Francostenensis’). On his 1793 MA thesis, De nihilo, he added ‘Franckensteina-Strataemontanus’ to his name. Thus, over the course of just a few years, Dippel used three different versions of his designation of origin, concluding with what might be interpreted as a pseudo-Latin rendering of ‘from the Frankenstein mountain road’ (Frankensteiner Bergstraße). Admittedly, this is my own wild guess—and nothing more—but the road leading up to the castle was called mountain road, i.e. Bergstraße, and it seems the closest fit with any nearby toponym. Whatever one might think about the resulting Real Frankenstein Potential, this certainly did not constitute a claim to nobility or descent from the line of local Frankensteins, nor would contemporaries have mistaken the designation of origin for Dippel’s name: he was born to a simple Lutheran pastor and his wife who had happened to seek refuge in the area due to French attacks. As soon as this became known, everyone wanted to converse with me and hear my oracles on his future fates; I had to protest forcefully that I was no soothsayer and interpreter of omens but had learnt about these conjectures and other useless things out of curiosity, because I wanted to be well-versed in everything knowable; but I didn’t want to teach anyone in these who might abuse them superstitiously. Writing in 1698, right after his conversion through the influential Gottfried Arnold and two of his companions, Dippel obviously wanted his previous life to appear as roguish as possible, so that his born-again, Christian life might shine all the brighter. It’s therefore advisable to take these two anecdotes with a grain of salt, knowing that Dippel shared them with an agenda in mind. Unfortunately, Florescu doesn’t cite any sources for his contention that ‘local gossip implicated Dippel in bodysnatching episodes at a neighbourhood cemetery’ (In Search of Frankenstein, p. 78). Just for this reason it’d be justifiable to dismiss the statement as unfounded conjecture, but early-modern practices render it even more unlikely: as a rule, criminals sentenced to death were denied proper burial, their bodies rotting away exposed to birds, dogs and the gawking public—or providing the anatomy theatres of universities with a steady supply of corpses. In Straßburg, moreover, the anatomy theatre established in 1670 was conveniently situated next to the hospital, as may be read on p. 33 of this article on the history of the local anatomy chair. Simply put, there was precious little need to disturb the rest of the dead in their graves. As a preliminary conclusion, other than the fact that Dippel may have been born on, or very close to, Castle Frankenstein and occasionally committed this to paper when specifying his place of origin, his Real Frankenstein Potential seems to have been decidedly overrated so far. I hope to explore more of it in the near future—including Dippel’s shifting fortunes as an alchemist, a reading list he partially shared with Victor Frankenstein, his reputedly all-curing animal oil, his attempt to gain possession of Castle Frankenstein in exchange for an alchemical arcanum late in life, and his mistaken prophecy that he would live until 1806. So stay tuned and watch this space! This entry was posted on Saturday, June 8th, 2013 at 8:02 pm	and tagged with alchemy, Castle Frankenstein, chymistry, Darmstadt, Frankenstein, Gothic literature, history of science, Johann Conrad Dippel, Mary Shelley, radical Pietism, Radu Florescu and posted in Uncategorized. You can follow any responses to this entry through the RSS 2.0 feed. Part two sounds quite juicy – looking forward to it! You sir are starting a very promising blog here, keep it up! But still, when trying to explain Frankénsteïn’s name, Douthwaite falls back on Florescu’s hypothesis. And as the names in the novel tend to be meaningful, there should be some rationale behind its choice. Dippel’s oil was used in the first photographic success. The image on pewter plate was done in 1827. German scholars declare that Dippel is like Goethe’s Faust, it is likely that Goethe was inspired by stories of Dippel while reading from the Sorrows of Young Goethe at the Frankenstein ruins to his circle of friends. Dippel’s use of Democratus as persona in book is also used by Richard Burton in Melancholia.